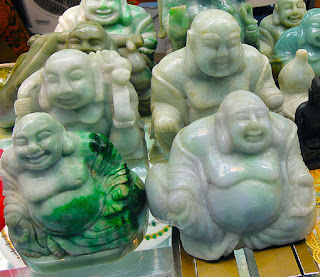 I am always puzzled to find out where to buy the best Jade Buddha statues when walking through the halls of the Bogyoke Market and discover this amazing jadeite artwork in many colors. 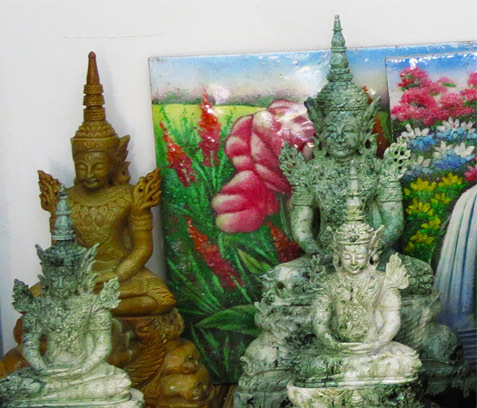 Click the link above to see the various sculptures Buddha Statues and the materials used to create the pieces of art can be ordered below.The fact is when intending to get real fine jade buying it there travel expenses will be offset by the actual price after some negotiation, they also will do the shipping if you like. 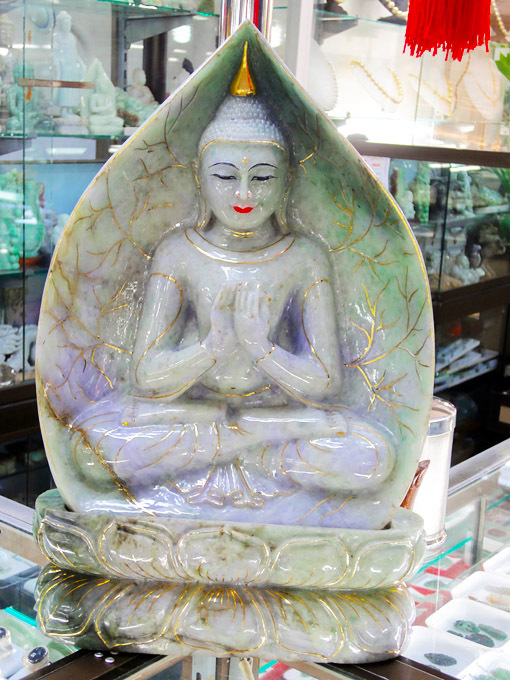 The statues are made from nephrite jade and jadeite by carving from local artists in a skillful handcrafted process. Only the best raw materials are used which naturally means he best green jade teak-wood and other hardwood you select them on the page where they are pictured including a description this are the ultimate interior decoration in houses and offices and unique pieces of art. Sculptures are made with different ideas behind such as Buddhist and Chinese and Indian deities are some of the most prominent objects highly sought after since they look good as decorative elements in any room office and temple. In general, the question is do they make pretty home decoration and bring life into a room? 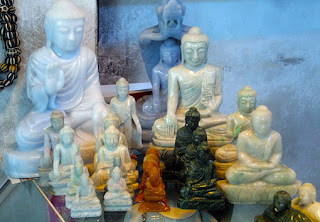 With a jade Buddha, the question is also which kind of jade? What Size? Which color will match the environment and for what purpose? Is it a religious, pure art or maybe just radiate a positive aura, shapes, ideas and endless other options. Are they abstract sculptures, of people, animals or any other stylish objects crafted with interesting ideas behind. One of the most important to think about in the very beginning is to place the beautiful and sometimes expensive piece of art somewhere where they can’t fall down. Especially onto a stone floor because although jade is one of the toughest material around (almost matching diamonds) it can break. Imagine you bought this beautiful carving somewhere and after it’s broken? That’s not the idea Jadeite home art should end up. Jade sculptures coated with ruby and / or gold dust. They are very popular with Chinese and Japanese people . If you are interested in the jade coated artwork don't be shy to ask more questions. Pls. use the comment section below or the contact / email. 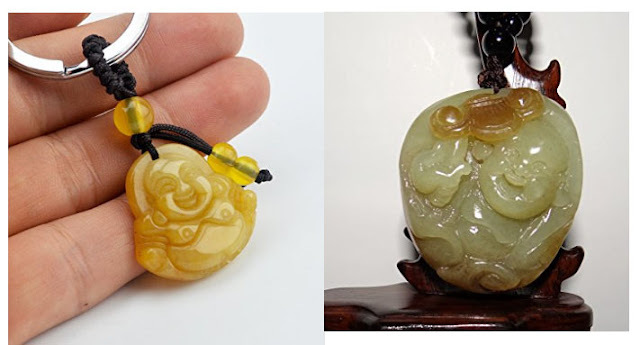 Jade Jewelry is the favorite with Chinese ladies but also men like them usually in form of rings and pendants. 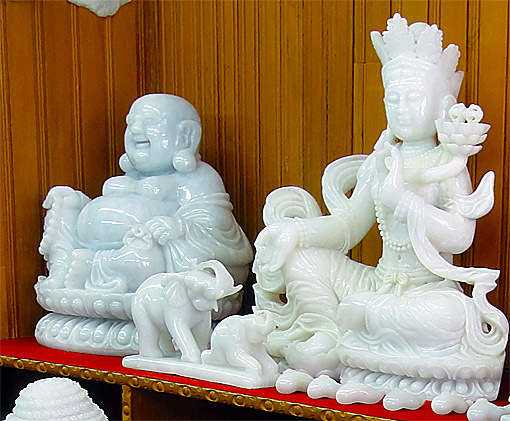 The statues are mainly made from white jadeite jade and often below 30 cm height to make sure they have a uniform color over the whole object which is not easy at all. Jade stone always has some veins of different colors and the bigger is gets the more difficult it is to find the required one evenly distributed. The most common hue is white, after it's lavender and green, in recent times artists use gold for additional decoration and sometimes ruby and gold dust to cover part of the statue. 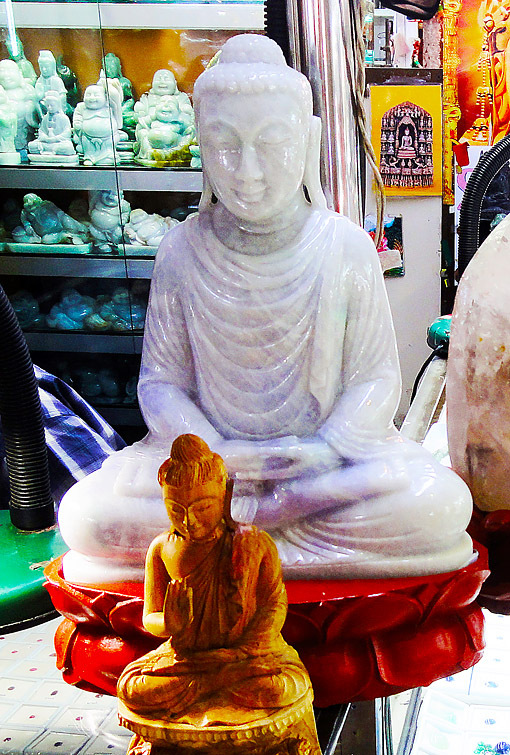 People buy Buddha statues for various reasons, for several, it is simply decorative and has a somehow spiritual aura. 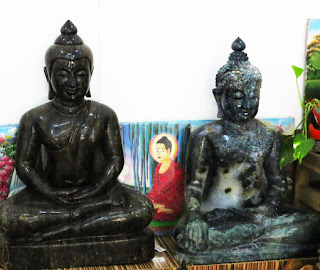 The Jade Buddha Statues above are between 30 & 40 cm height and $ 260,- and 300,- + for shipment but we would need the destination address and if air shipment or surface to make a cost estimate. Actually shipment is rather not costly also jade stone is quite heavy. Sculptures show the Buddha mostly in a seated position which depicting mudras with soles turned upward and locked in the lotus position, the right hand in the earth-touching mudra, symbolizing the moment of enlightenment, this is the prevalent iconography of this figures. 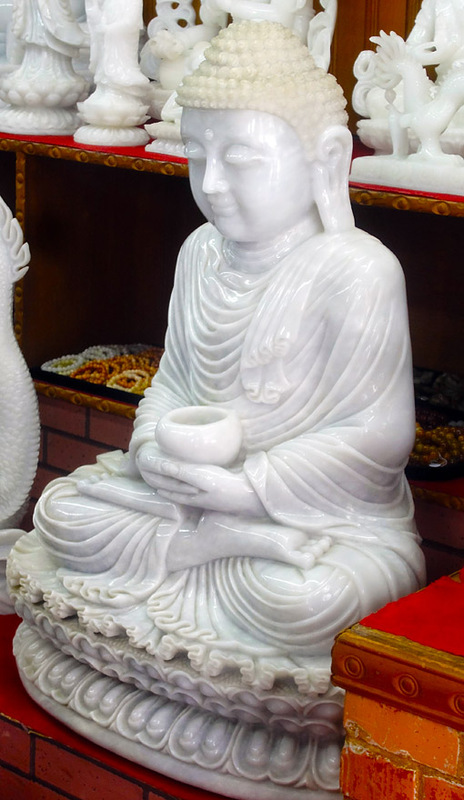 The statues are mainly made from white jadeite jade and often below 30 cm height to make sure they have a uniform color over the whole artwork which is not easy at all. Jade stone often have veins of different colors and the bigger it is it gets the more difficult to find the required stone with a evenly distributed color. The most common hue is white, after it's lavender and green, in recent times artists use gold for additional decoration and sometimes ruby and gold dust to cover part of the statue. 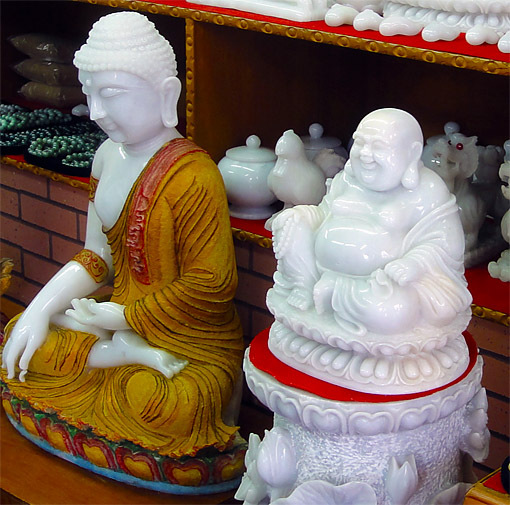 People buy Buddha statues for various reasons, for several, it is simply decorative and has a somehow spiritual aura. The temple was occupied and destroyed in the year 1911 uprising which overthrew the Qing Dynasty but the statues were safe. They were shifted to the current location. Although the history is not very long, the old-time and classical architectural style makes it more appealing in this modern city. The sitting one is kept in the tower and the reclining is placed in the recumbent hall of the temple. The sitting signifies the moment of his meditation and enlightenment. In the reclining, the sedated face shows the peaceful mood of the lord when he died. This posture and shape are called the 'lucky repose'. 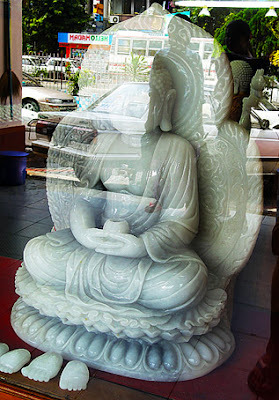 Why buying a Jade Buddha? Simply just follow your soul and ask yourself what does it trigger in you, is it an art reflex, spiritual, representative or what? There are a couple of possible reasons which make sense. 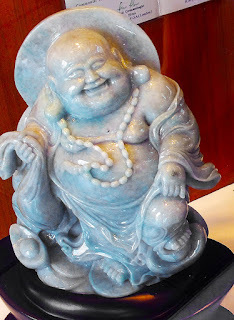 Many different kinds of sculptures are available most sought after are sitting and laughing Buddhas which creates a good feeling. Worshiping the sculptures is rather in a Buddhist environment maybe as the center of a shrine as it is very common in many homes and offices in Asia. Actually, not only there, I have seen some of the nightclubs, bars and natural in Buddhist Temples or maybe try practicing Vipassana meditation by using this and object to focus on. They also have Chinese Taoist creations which look very similar to normal Buddhist sculpture. Another subject to focus on is in which Mudra posture the piece of art is shown. Most common are sitting postures and having hand and finger in various positions which have different meanings. To make a decision it could be worth to think about why not to do some holiday travel, let’s say to Yangon Myanmar and visit the Bogyoke Market. Since your object of desire will probably cost a few thousand dollars anyway why not get it right at the sources and maybe save some money on top of it. You could find the piece you like and have it shipped from the shop directly to your home. I have done this several times and the shops are used on this which means it is very unlikely that anything will happen, just get it insured and all is fixed. You also won’t have any problem with the weight which can be quite heavy when it gets over about 30 cm height. 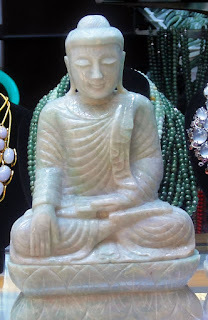 The raw material of the jade Buddha is natural jadeite jade which is from a higher quality as the usual Chinese Jade which actually is nephrite used since thousands of years. It is mined in the north of the country which is Kachin State and brought to Mandalay where the actual figurine is made. Many of the raw stones are directly exported to China (often smuggled) and there is becomes “Yunnan Jade” after the manufactured pieces are sold as local made. Its Chinese craftsmanship which brings the sculptures virtually alive. Chinese probably produce the best quality in terms of carving and sculpturing which brings artwork to “life”. Two statues of Lord Gautama Buddha made from ornamental white stone resides in the Temple in Shanghai with a mystic smile they are not really laughing. 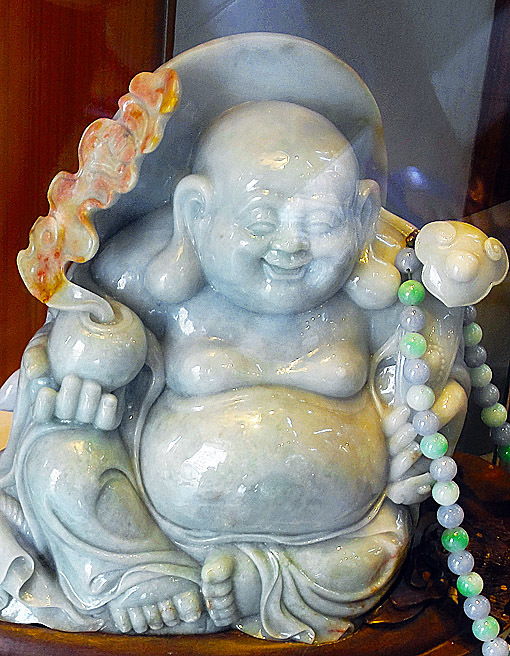 Since the 21st millennium, the trend is to buy laughing Buddha statues is for sure of the laughing version. These sculptures are not cheap at all when they are made from genuine jade jadeite. details since pendants are too small and most high-end pendants are made from a translucent material which makes them shining through. It needs at least figurines of a minimum of around 5 cm height to see some real artwork. Today they are from jadeite which is the better version of the green stone, the other is nephrite. Jadeite is mined in northern Myanmar around Hpakant and is often smuggled into China and Thailand. That also fits the fact that many buyers are not Buddhist since this jade is for decorative art just to look pretty and is something different. Since this beautiful artwork is also quite expensive it is possible to create a valuable and somehow representative atmosphere in a room, it won’t matter if it is in an office or home read more. The main question here is buying jadeite or nephrite items. Upmarket shops are in high-end malls e.g.at the Sands Casino at Marina Bay Singapore and in every big city on the planet where a substantial Chinese population is. There are always two subjects to consider, to buy a jadeite statue or nephrite sculptures. Asking where did the statue come from is again a dual question since there are two variants. Creative sources are Myanmar but most often it's China where manufacturing is done. The raw material is from Burma and other countries since nephrite is mined worldwide among them are Canada, New Zealand and other. Many Chinese people have a somehow mystic connection to the green stone which considered a symbol for good plus pure. On top of that, it is very decorative. Cultures used the mineral for different purposes such as Mayas and Olmecs in the Americas but nowhere is this green stone so deeply rooted in culture. Ornamental plaques have been detected up to around 7000 years back in excavations of the HsingLumg culture in Inner Mongolia. Over time sculptures were placed inside temples made from the green stone, and sometimes white stone plus a combination of them. The Jade Buddha Temple sculptures in the Shanghai temple are probably the most famous, built in 1882, destroyed in 1911 and rebuilt in 1928. 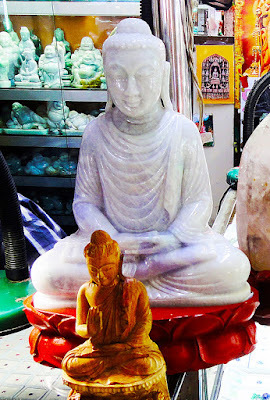 Two white statues are still there, they are crafted from excellent white Burmese jadeite material and have been imported from the country long time ago, in this temple, there is no reclining Buddha. One of the biggest reclining Buddha is located near Bago east of Yangon in Myanmar (Burma) which is a brick and steel construction. I you have some other ideas in terms of sizes and materials pls. contact us we have plenty of alternatives such as this Buddha Sculptures from various materials.